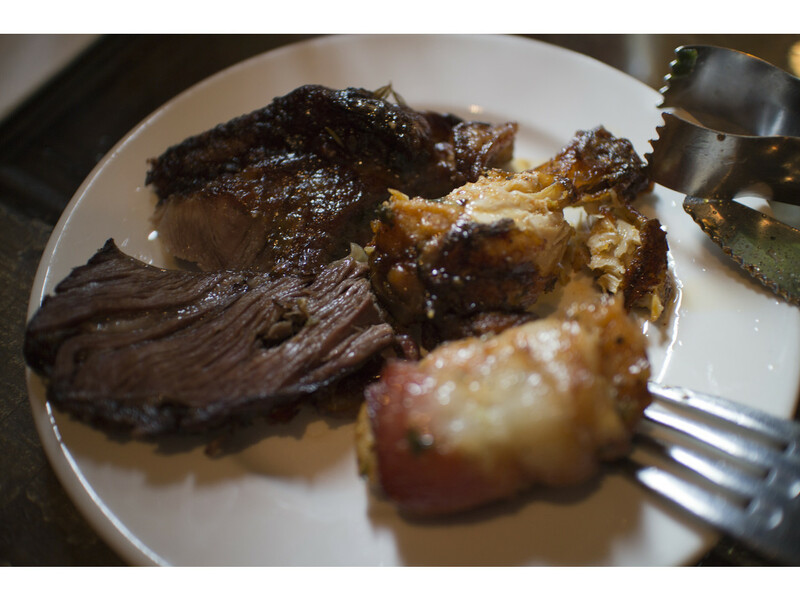 We’ve been enjoying Brazilian BBQ and we’ve been hearing nothing but wonderful things about Gaucho Brazilian Barbecue so we thought we’d give it a try. It’s on the main level of a professional building just North of Chinook Centre on the East side of Macleod Trail. It can be tough to find and there’s really not too many parking spots that are reserved for “visitors”. We knew we were going to do the Dinner Rodizio which is a Brazilian style serving style where the servers come around with giant skewers of food (the same type) and they’ll cut you off a piece if it’s something you’d like to eat! As well, there is an unlimited salad bar with some other side to accommodate with your dinner! It’s a fun experience! Once you sit down and figure out what you want, a basket of fried polenta came to our table with some sauces. It’s a great appy, but I usually save the room for the ready meat food! I ordered myself a glass of Limonade which was delicious and refreshing limonade made with limes and it’s zest! It’s great for a hot day or any time! The other drink we really wanted to try was their Tropical Juice – Cashew Juice and to be honest, it didn’t taste like cashews where in fact, it tasted like guava. It’s no big deal if they gave us the wrong thing, but we’re not sure! The types of meat the dinner rodizio had was chicken hearts, lamb, parmigiano beef, top sirloin, rump steak, beef ribs, pork loin, sausage, chicken wings, and chicken wrapped with bacon! At the end of the night, my favourite was probably the chicken hearts and the beef ribs! I had many servings of those! I had at least one of everything and I’ve got to say it was delicious! I wouldn’t mind bringing family and friends here if they were hungry! My husband really likes Cracker Nuts and I have to be honest, I had no idea what this was prior to meeting him. I’ve seen them in grocery stores everywhere, but I just never had them until recently! They have lots of flavours, and each flavour is very flavourful and tastes like what it’s suppose to be! Inside a pack of these “cracker nuts” are nuts with a very crispy & crunch coating, that is then tossed in really good flavoured powder. We got the BBQ pack this time, but there are lots out there! 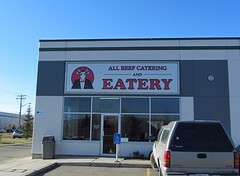 After we’ve been eating at a few “smoke houses”, we were really craving something quite similar, and we were recommended to All Beef Catering & Eatery for BBQ style beef. They use “AAA” Alberta beef and they magically transform it into perfection! This little hidden gem is in the Industrial area in Calgary’s southeast corner at the intersection of 52nd Street and 64th Avenue. It is on the west side, so I find it best to go East on 61st Street and then South (right hand turn) onto 52nd Street – making a simple right hand turn into their parking lot. We ordered 2 sandwiches, both for $9.95 + taxes and we split them. 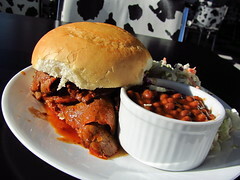 The first one we ordered was the BBQ Beef on a Kaiser Thinly sliced beef simmered in Bull’s Eye BBQ sauce, served on a kaiser with creamy coleslaw and baked beans. The beans was sweet and tasty, while the coleslaw was crisp and not over dressed, but creamy. These sides were just as delicious as the main event, the BBQ Beef on a Kaiser! The BBQ beef was extremely tender and juicy, and covered in their BBQ Sauce, which surprisingly wasn’t over powering at all! It was messy and the bottom piece of the kaiser bun was drenched and over saturated in BBQ sauce, but it made for a delicious sandwich altogether. Whenever possible, I try to not turn down an opportunity to try a Philly cheese steak sandwich, so I decided to order and try their Philly! 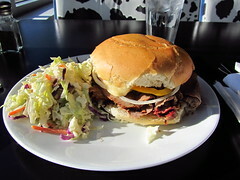 It wasn’t nearly as messy, and it was made of the typical thinly sliced beef, onions, mild peppers, melted cheese on a kaiser with creamy coleslaw on the side. I think the meat that they choose for this sandwich was a little too dry, but probably perfect for the beef dip as it’ll have some sort of gravy. Besides it being a tad on the dry side, it was super tender and quite a tasty Philly. The mountain of beef slices they use make quite a filling lunch, and probably a great dinner. As much as I would love to be back for a fresh sandwich for dinner, All Beef Catering & Eatery isn’t opened for dinner. 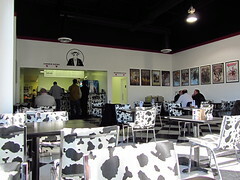 They are only opened to cater to the businesses in the Industrial Area, so they are opened weekdays from 11:30AM to 2:00PM Monday through Friday, except for holidays when they are closed. This is a great place to get a big lunch – and it’s worth it! The really do fill the sandwiches jammed pack with meat and I think it was a great discovery! I will be back if I’m in the area at the right time!